Please note the new start time at 10:00 pm. 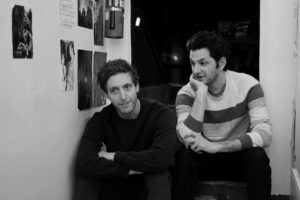 Thomas Middleditch (“Silicon Valley”) and Ben Schwartz (“Parks and Recreation,” “House of Lies”) perform two-person long-form improv. Thomas Middleditch stars as the lead of the hit HBO comedy series “Silicon Valley” created by Mike Judge, John Altschuler, and Dave Krinsky. Named one of the 10 Comedians to Watch by Variety in 2012, Thomas has played roles in “The Wolf of Wall Street,” “The Campaign,” and “Fun Size.“ Thomas is one of the founding members of The Improvised Shakespeare Theater Company and a frequent collaborator with both Funny or Die and College Humor. Ben Schwartz is an Emmy Award-winning writer, actor, and comedian. He’s starred in the television shows “House of Lies” and “Parks and Recreation” and is the co-author of the national bestseller, Grandma’s Dead: Breaking Bad News with Baby Animals and its two sequels. This fall, Ben’s latest book, Things You Should Already Know about Dating, You F***ing Idiot, which he co-wrote with Laura Moses, will be released by Hachette Books and adapted to television for CBS and Gary Sanchez Productions.